Express Employment Professionals, along with its franchise locations in Arkansas, Georgia, Michigan, Oregon, Washington, North Carolina, Colorado, Wisconsin, Utah and Minnesota, is donating $75,000 to 10 nonprofits as part of it's philanthropic initiative, The Impact Project. 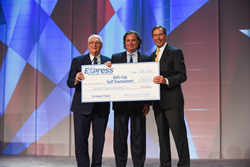 Express Employment Professionals, along with its franchise locations in Arkansas, Georgia, Michigan, Oregon, Washington, North Carolina, Colorado, Wisconsin, Utah and Minnesota, is donating $75,000 to 10 nonprofits. The donation is part of The Impact Project, an initiative of the company’s philanthropic committee designed to give back to nonprofits nominated by franchisees among their more than 760 franchise locations. Kid’s Cup, a golf tournament supporting prenatal and new infant care in Minnesota, was the grand prize winner, receiving a $20,000 donation. The fundraiser was founded by Mark and Sheryl Tasler, owners of the Rochester Express office, and has donated more than $1 million to the Mayo Clinic Children’s Center and the Olmsted Medical Center. Express puts people to work. It generated $3.02 billion in sales and employed a record 500,002 people in 2015. Its long-term goal is to put a million people to work annually.